This is our first entry, and most recently we have been invited to have a low-maintenance Monday column on the Canadian Garden website. We are posting the introduction of each featured plants and if you are interested in learning more, please click on the website provided each week. 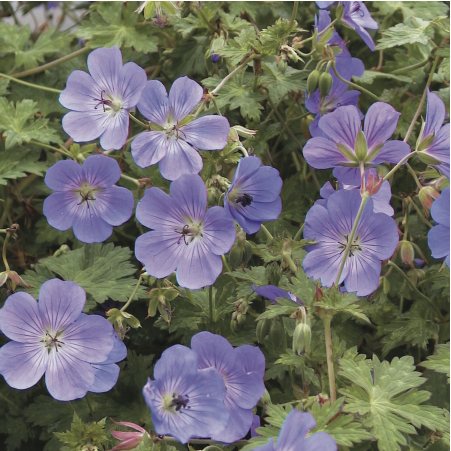 In the meantime, enjoy learning about Geranium ‘Rozanne’, one of our all-time favourites. Geranium ‘Rozanne’ (Cranesbill geranium ‘Rozanne’) is one of the top ten plants chosen by our 17 expert gardeners in Gardening from a Hammock. We asked the gardeners not to include geranium ‘Rozanne’ once it was already mentioned, but Lorraine Flanigan, in her Onesy-Twosy Garden chapter couldn’t resist. She explains that it is “far and away the best geranium”. The reason? It blooms blue from mid-June to the snow, and doesn’t get leggy like so many other geraniums. Marion Jarvie, in her chapter the Aristocratic Garden, appreciates the two-toned green foliage of the plant. She adds tht if you buy a plant, by its second year it will have spread significantly. When you look up the plant in the botanical chart on page 114, you will see that this geranium has many uses: accent; edging; groundcover; long blooms. A big bonus is that it thrives not only in the sun, but also in part shade. It is a sprawling plant with deeply cut green leaves and large violet-blue, cup-shaped flowers. The flowers grow 30-50 cm (12-20 inches high) but sprawl at least 45-60 cm (18-24 inches). Geranium may have some medicinal usage does attract humming birds and beneficial insects not sure about this geranium for sure would have to research it. I chose this geranium for a mass planting in a large central tier of a rock garden at my lake home in Haliburton, Ont. I love it for so many reasons . . . the colour against the rocks for one, the fact that it does well in partial shade, and the low maintenance! If you’d like a picture Ellen, I’d be delighted to send you one when the plants are in bloom this spring.